I am always amazed at the Japanese inventiveness around kawaii. In case the idea of kawaii is new to you, kawaii (pronounced like Hawaii) means “cute.” And Japan is obsessed with kawaii, so much so it seems nothing is untouched – see related articles link below on past kawaii topics. The latest to be kawaii-ified? Check out this kitty fishing capuccino. 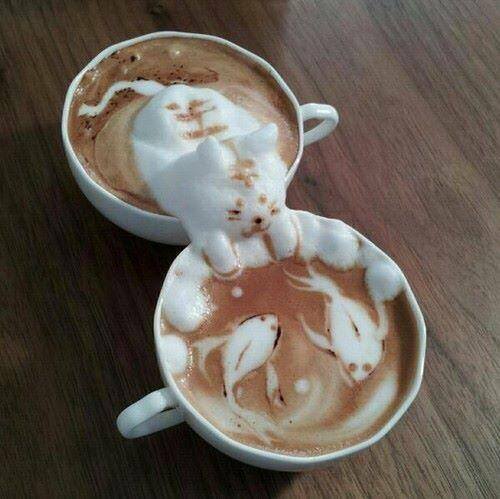 I love how they used not 1, but 2 cups to create a tableau of the kitty hunting koi fish in a coffee koi pond. What will they think of next? Hope this gives you a little smile this June Monday. Previous postPhoto Trek - Visit Jinli Street in Chengdu, China Next postRead Chubby Hubby - for the Best Macaroni and Cheese Recipe, My Mother's! This is taking Latte art to a new level – I love it!